There's a real shortage of good books on advanced witchcraft. 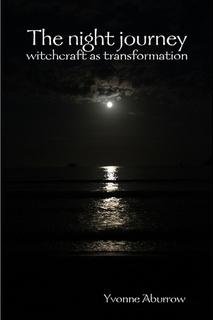 The Night Journey - Witchcraft as Transformation is therefore a much-needed new publication aimed at Wiccans and witches who have reached second degree or who are running their own covens. The work at second degree involves looking at the darker sides of our own psyches, confronting our fears and challenging our perhaps long-held beliefs. The goal of this is transformation, and this book is a guide to ways of enabling that to happen. The Night Journey follows on from the first book in this series, Dark Mirror - The Inner Work of Witchcraft. That was aimed at trainee witches and first degree Wiccans. Rather than just being about what words to say or actions to perform for rites and ceremonies, it was about how to feel the energy and what happens in the practitioner's psyche. Yvonne Aburrow is a social justice campaigner. In this book she looks at how witchcraft, historically, was resistant to authoritarian versions of reality, but also how we can make our own covens and public events more inclusive and welcoming. You can view The Night Journey on Amazon and view the book's Lulu page. Now available as an e-book (thanks to help with formatting from a dear friend)!